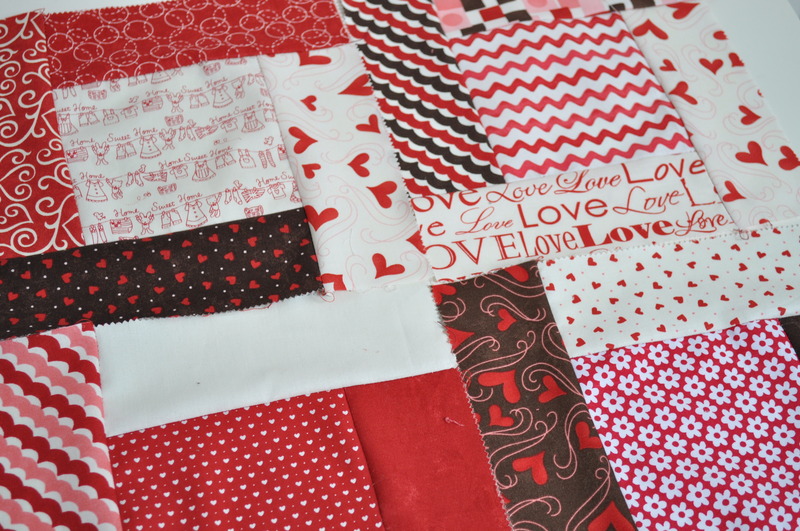 Even though the patchwork block swap I’ve been participating in hasn’t quite finished yet – there’s one month to go – I have actually made all the blocks I need to and I’ve already started getting withdrawal symptoms. Kate and Sue who have run the F2F (Foot Square Freestyle) swap for the past two years, have decided they need a break from organising duties and as I am more of a participant than an organiser I didn’t offer to take it over so, sadly, when Claire receives her 24 blocks from 8 other quilters around the world by the end of February, that will be it. I searched around the web for other swaps but the few I managed to find had either already started or didn’t appeal. 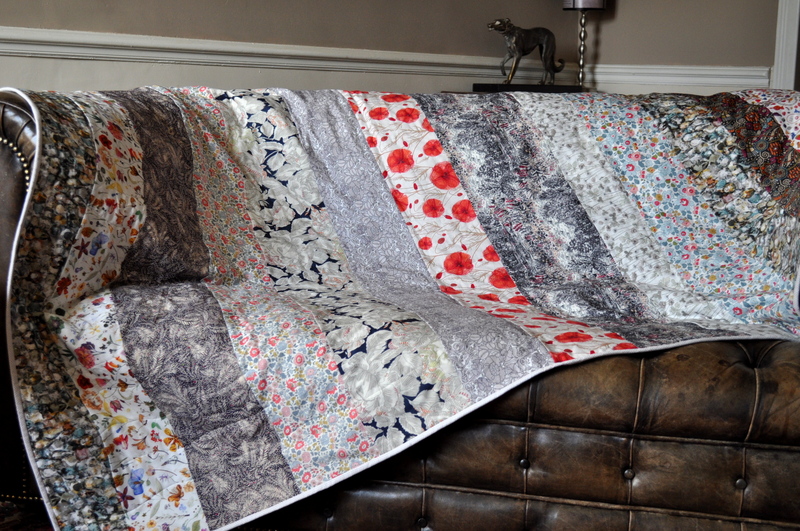 Kate has started making a quilt – unusually it will be for herself – from a book both she and I have had for years. 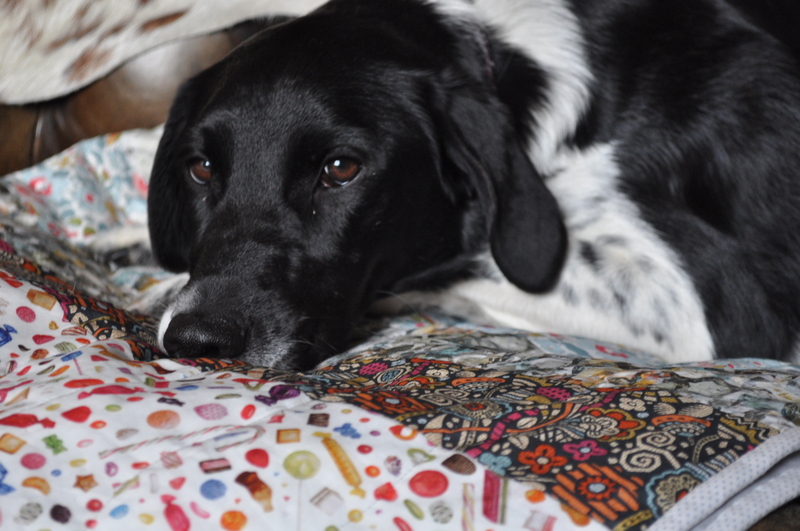 We’ve both been in love with one particular quilt inside it – I even made the templates for it and one block back in the mists of time – but never got any further. It’s rows of vintage hatboxes made to look as if they’ve been covered in wallpaper, as olden day people used to do, and each one set in the angle of a little cubby hole with a floor and two walls. So, lots of design decisions to be made. Kate has been busy with it for a few months now – you can see her progress here – and I decided I would join in with her and we would aim to make three blocks per month and publish them on our blogs at the end of the month. This will be my motivation. 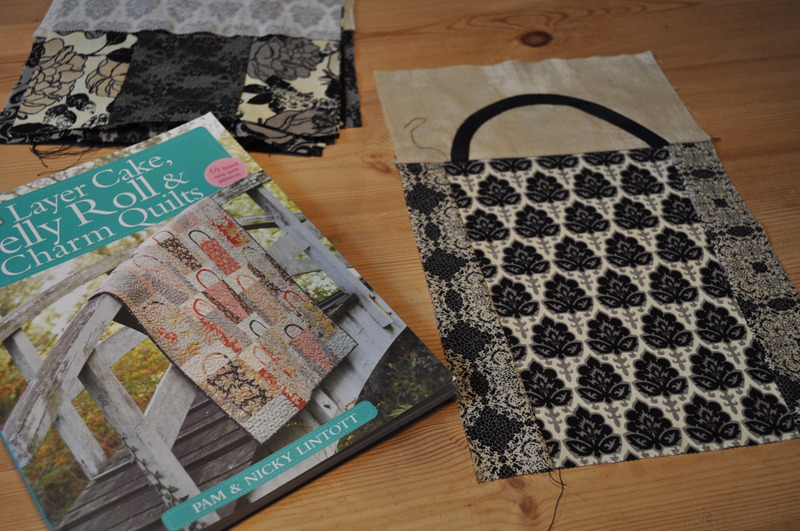 I am making a wall hanging for my bedroom rather than a quilt – there is an empty wall behind the bed and I thought this might go well there rather than a picture. I don’t want it to dominate the room or anything so I’m not making it too large, just four blocks wide x three blocks high. If I make three blocks per month, it should be ready to start putting together in May. Each ‘cubby hole’ is constructed by joining two trapezoids, one reversed, plus an 8.5 inch square which is set in to the angle of the trapezoids. Eek! I was so pleased when I got it right first time and then realised my perfect seam would be covered up with the hatbox appliquéd on top – still, that’s patchwork for you. Here’s a ‘blank’ just so you know I can do it. And here’s the block after the hatbox has been added. I decided to use scraps for the backgrounds where possible and Liberty tana lawn for the hatboxes. I realised too late that, because the tana lawn is so fine, you have to be careful what you put underneath it. You can see the stripes of my ‘flooring’ vaguely show through but I thought it sort of looks like part of the design on the box so I’ve left it. This one is a darker print so I got away with it here but, for the other blocks, I won’t use that particular striped fabric. I am not usually an ‘appliqué person’ but Kate has got me trying several techniques I’ve either never done before or previously said I’d never do such as foundation paper piecing so here’s one more to add to the list. I am using Bondaweb to attach the hatbox shapes and then using a turquoise thread and machine appliquéing on to the background. This next one had to be re-done because I had used light coloured tana lawn for the hatbox and the ‘floor’ was showing through and making it look as if there was a shadow across the box. I had to peel it off – a tragic waste of both Liberty and Bondaweb -and use a darker design. You live and learn. I will finish by proudly announcing that I have managed to complete Dry January without a drop of alcohol passing my lips – apart from that used in cooking which doesn’t count because all the alcohol comes off as vapour (boo!) . I never usually touch Pastis – the favourite aperitif of the French – because wine is my poison and the aniseedy alcoholic tipple makes me go woozy very quickly which is a feat in itself. However, Ricard (the favoured brand of the French when imbibing their favourite aperitif) make a version called Pacific which has no alcohol, no sugar, no calories, no nuffink apart from quite a few E numbers but I haven’t looked them up to see whether they are dodgy ones. As with the real stuff, you dilute it with 5 parts water but, unlike the real stuff, it is already a cloudy colour. This, and Bucklers non alcoholic beer (which is really Lager if you are British) , kept me on the straight and narrow when temptation threatened to overcome me. I don’t know whether you can get it (or Bucklers) outside of France but, if you can, and you are the designated driver or want an alcohol free evening for any other reason, I would recommend it. I used to ‘do’ upholstery. I have all the gear – a hide mallet, tack remover, a webbing stretcher, hammers, tacks, horsehair, etc. etc. but after a few years I went off the idea. I bought a chaise longue (interestingly, not called that in France unless you mean a garden recliner) from a junk shop and did it up but, nine years later, it had got a bit faded, saggy and generally in need of a facelift. I know the feeling. 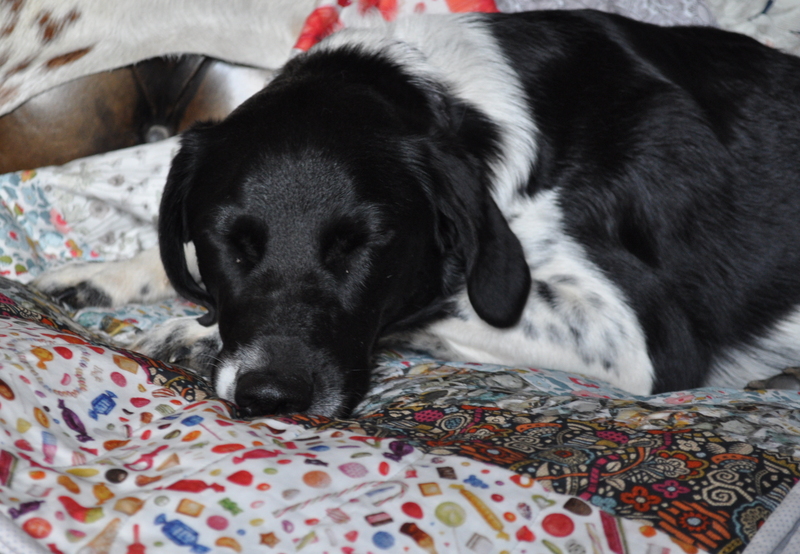 It was still comfortable – ask my dogs! – and the framework is very good as it was made before the days when most furniture is made to be chucked out after a few years, so I decided to pay somebody to re-do it for me. It took her about a week – it would have taken me much more. I can’t get a brilliant photo because it is next to a French window and the light is shining on the metallic threads so it is not quite as ‘blingy’ as this but you get the idea. I got the fabric from Turkey and could have had red to go with the cushions on my sofa but decided to go a bit mad with the orange – although there are dark red bits on it which you can’t see for the duff lighting. Anyway, to make up for being lazy with the upholstery, I decided to buy some more of the Turkish fabric – both in the orange and also some red mixtures – and make new cushion covers for the L-shaped sofa we have as the current ones are splitting at the seams and spewing feathers all over the place. Two completed ones above although not being displayed on their intended sofa because this one has better lighting. Mr. Tialys has insisted – despite my protestations and tears – that they should all have piping. I drew the line at zips though and they will all have envelope backs albeit generous ones. Two down sixteen to go. Then I had a couple of dog collars to make and, while I had the webbing to hand, I fixed my neighbour’s sandals. All of which is to explain why my F2F quilt is still not finished. Kate who, along with Sue, organized twelve of us for this block swap, is keen to see another finished quilt so I am trying to steam ahead with it and thought I’d do a progress report and prove to her that I am on the case. Thirty six blocks have been sandwiched and ready quilted (I’m using the ‘quilt as you go method’). This will be the second row but I have laid them out as a double row for ease of photography. The backs of the blocks where you can see some of the quilting – machine only I’m afraid but I am trying out different methods such as free motion quilting on some of them as, at this stage, they are like mini quilts and easy to get under the machine. Using the four backing fabrics, I made some improvised blocks for cornerstones. 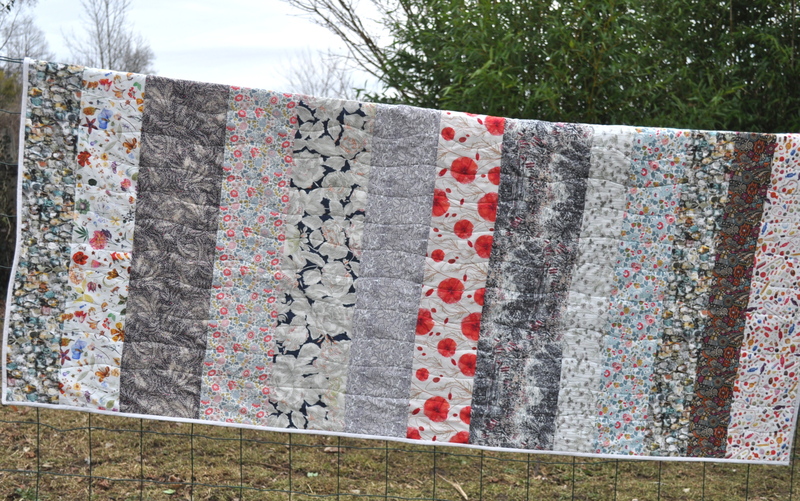 This block, from Emmely, was a natural choice for one of the corner blocks of the quilt and lends itself to my favourite form of quilting – on the machine, in the ditch, easy! and it also worked well with the back. Some of the blocks were a little ‘scant’ when I came to join them and didn’t quite get taken into the seams of the sashing strips. I used this printed tape, attached with bondaweb and then sewn into the seam allowance at the top to hide the gap and prevent fraying. It’s not an ideal solution but I couldn’t lower the sashing strip any more otherwise I’d risk losing details from the adjoining blocks. Any other ideas gratefully received as I’m sure I’ll come across other anomalies when I join the remaining rows. So, here’s one row sashed vertically and once horizontally just to prove that I am getting on with it. I’m waiting for more piping cord to arrive in the post now and all of my neighbour’s other sandals are in good condition so no more excuses and, hopefully, the next images will be of the finished quilt. Now I’ve put it in print I have to do it! SPOILER!! 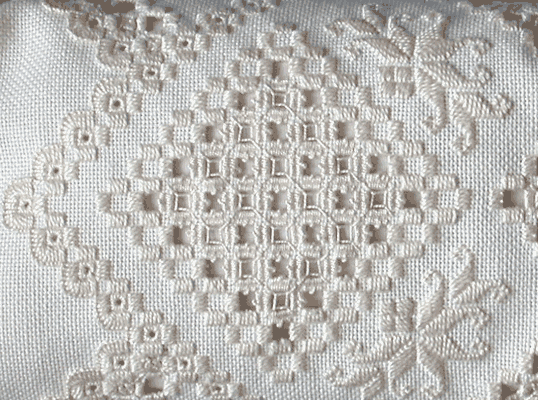 The block row joining is not going as well as I had hoped – the seam ripper has been put into service and many many tiny stitches have had to be undone. This is mainly due to the fact that I was concerning myself more with attaching the sashing nicely and not with butting up the batting properly so ending up with empty sashing which is not a good look (or feel). Although, now that I’ve put it down in plain type, I think ‘butting up the batting’ ought to be a phrase brought into common usage. I’m cancelling everything today apart from finishing my WISP (work in slow progress). Three days to go and I have to hand quilt a queen size cover and then bind it. It could just be possible if I fend off appointments, visitors, dog walks, housework., eating, washing, Etsying and phone calls. 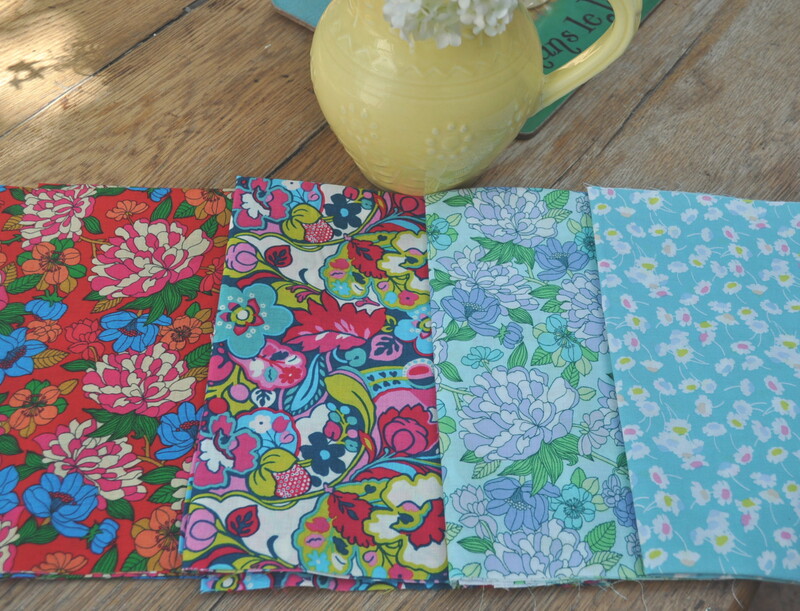 Saying all that, I just had to show you these gorgeous new Liberty of London fabrics that arrived yesterday with my postman who I love because he brings me such lovely things although he is a miserable old twonk. These are from the new Lifestyle Collection which is Liberty of London’s beautiful new line specially designed for quilting and crafting. They are not as fine as the divine Tana Lawn and, therefore, much cheaper and, therefore, much easier to cut up and use in patchwork. Tana Lawn will always be my favourite but the designs, as always, are sooo gorgeous and you can’t argue with a less expensive alternative for some projects. Anyway, off to hand quilt heart and bird shapes . Hopefully I will be able to show you(and my daughter!) the finished article soon. I am supremely uninterested in the Olympics – a sad confession but it’s true. I’ve never really been one for watching televised sport and the more ‘professional’ it has become the more disinterested I am. I even managed to avoid the Tour de France again this year despite the fact that it goes right through our local town. Bah humbug! It’s not that I’m against physical activity. Last week, for instance, in an attempt at sociability with some sporty friends who were visiting their holiday home nearby, I went for a 4.5 hour walk. Don’t let the word ‘walk’ fool you into thinking it was a gentle ramble. For at least one hour, the route was so steep we could have done with crampons to hammer into the ground. I blame Mr. Tialys (who else?) as he was in charge of poring over the map and sorting out the route and his instructions (from me) were ‘no more than 2.5 hours and not too steep’ . It wasn’t helped by the fact that it was about 34 degrees and the humidity was very high but I suppose I can’t blame Mr. T. for that, although I did give it a very good try. Anyway, on T.V. the next day, still trying to be sociable with the visiting sporty types, we watched Jessica Ennis win the gold for G.B. in the Heptathlon and I did have a little tear in my eye and felt strangely jubilant and patriotic whilst pressing a bag of frozen peas against my calf muscles. It is the season of the vide grenier here in France and I am making the most of it. Saving up for a trip to Barcelona with her boyfriend, Madamoiselle Tialys the elder took a stall on Sunday to sell some of our tat and, making the most of having to be there at sparrow fart to help her set up, I was able to be in at the start to buy some tat from other people. I was rather taken with this doggie who, unlike most of the dogs in France that I find and bring home, won’t cost me anything in vet’s bills and food. I’m not sure whether to leave him as is or to give him a lick of paint – maybe even some paint effect thingy like crackling or something. 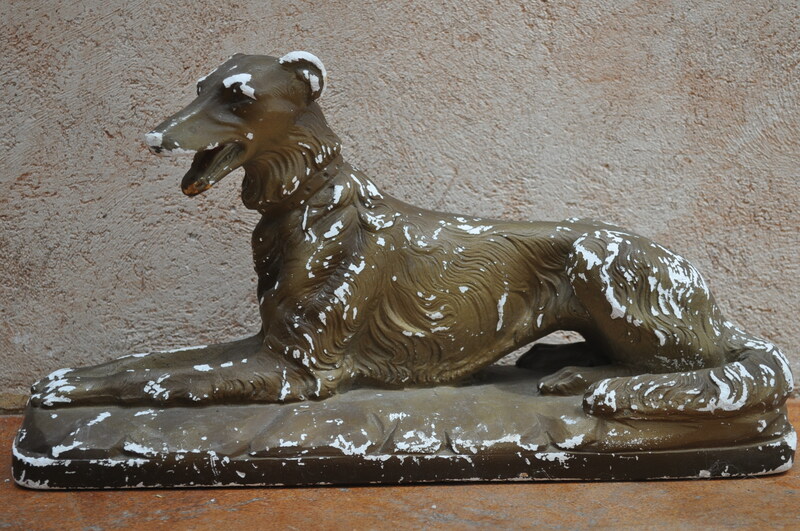 Maybe once I decide whether to put him in the garden or keep him in the house it might be easier to decide whether to keep him in his ‘chippy paint’ state or tart him up a bit. Having established that, although I have three dogs, none of them look remotely like this one, the woman I bought him from declared him a ‘coup de coeur’ which is a nice way of saying I am a bit bonkers and good luck explaining yet another ‘too heavy to post’ item to Mr. T. Speaking of which, I just had to have this too. It is sooooo heavy and my décor isn’t the least bit ‘industrial’ or ‘loft’ but it just couldn’t be left there. 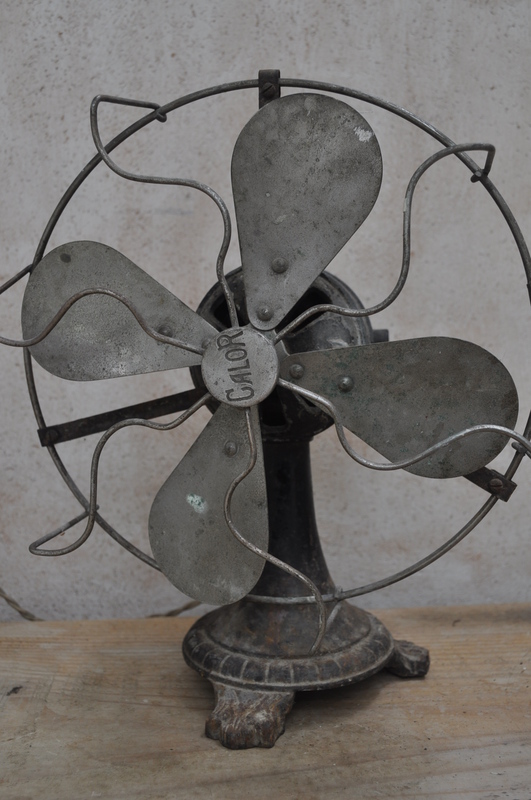 The visiting friends came round for dinner that night and we had some wine and very nearly had a game of ‘who dares to plug the very old fan in and see if it still works?’ but , thankfully, good sense prevailed and I lived to share the photo with you. Most of my time this week has been spent trying to complete the ‘two year quilt’ in time for Mlle T. the elder’s 19th birthday on Sunday as it should have been finished, you may remember, for her 18th birthday last year. Anyway, I galvanised myself into action and set to work a couple of weeks ago only to realise that I needed more fabric for the border and, because I have taken so long to make it, the fabric has been discontinued. After searching the internet high and low, I found somebody with some yardage left and it arrived from the U.S. today. I can’t tell you what a pain this quilt has been to make. Well, I can actually. The problem was that, instead of doing what all normal people do and make the top of the quilt first and then back it with some plain or patterned fabric, I decided to make the back of the quilt a feature too, with a panel in the centre and then some patterned fabric and then some pieced blocks around the border. To make matters worse, I made the back first. Then, of course, when it came to making the top, which is pieced, I had to make it fit the back. Bad idea. Don’t ever do it. Maths is not my strong subject and I have been having to make all sorts of calculations to make the top and bottom match up. At the moment, it seems to be working. Tomorrow I will attach the borders to the top and then it will be ready to be sandwiched together with the batting and the back. Fingers crossed. That leaves me Thursday and Friday to do some quilting (by hand) and Saturday to bind it. There goes the housework again. I don’t know whether I’ll manage it but I will let you know if I succeed. 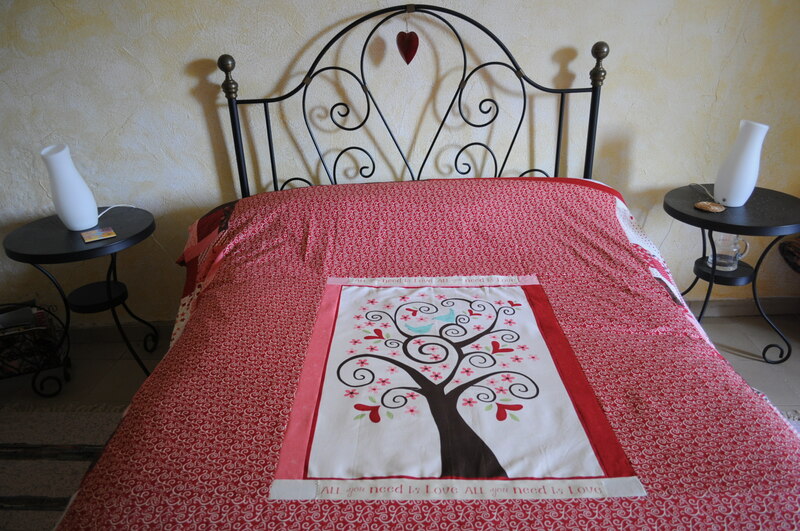 Here’s a reminder of the back of the quilt which I had actually finished in time for her 18th. 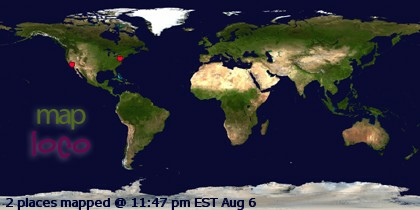 You can’t see the blocks around the border very well but they are there. What the hell have I been doing between then and now? 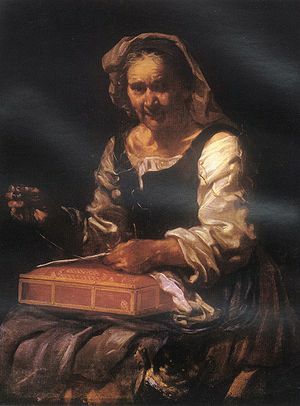 The scary thing is that it will be Madamoiselle Tialys the younger’s 18th in February and that’s only 6 months away. Better start buying in the fabric. 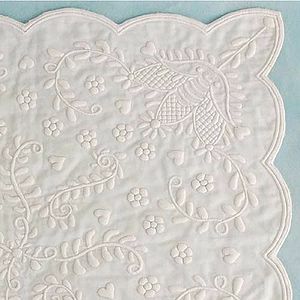 I don’t know whether you saw my post about planning a quilt for my daughter’s 18th birthday (a whole year away yet but it will go soon enough) here https://thetialys.wordpress.com/2010/07/19/planning-an-heirloom/ but I have promised myself to do a block a day and, that way, I should have the top pieced in around 3 months. I have made 9 blocks so far and I need 120. Having bought a jelly roll – which is 42 x 2 1/2 inch strips, cut across the width of the fabric – without any clear idea of how I was going to piece the top of the quilt, I then decided to use the coordinating panel on the back, surrounded by one of the fabrics from the range and completely piece the top – thereby making the quilt completely reversible. I deicided to make blocks with a square of fabric surrounded by 4 different strips. So, of course, I needed to buy 2 charm packs and another jelly roll, which wasn’t easy as this range was (I think) last year’s so isn’t widely available. I probably won’t need that much but, better to have more than not enough and I can always make other things from any surplus. I bought a book with quilt patterns using jelly rolls so now I’ve got another two which I may, or may not, start before I’ve finished Megan’s quilt. This is the reason my workroom is a bit of a mess . Too many projects on the go at once. 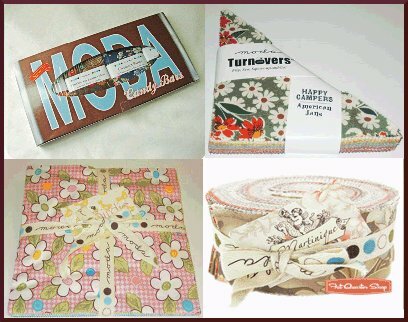 I’ve been trying to think of the best way to utilise the lovely fabrics that I bought to make my daughter’s quilt and, during my internet meanderings, I have discovered that there is now a veritable ‘menu’ of pre-cut fabrics to choose from. I love the names and the way they are presented. Moda even has a ‘Candy Bar’ pack which comes wrapped like a bar of chocolate. Yum! Here is a guide for those of you who, like me, haven’t made a quilt since there were only fat quarters and charm packs. A Layer Cake contains 40 or 42 10″ squares. A Candy Bar contains four pacs of 40 2 1/2″ x 5″ strips of each fabric included in the fabric lines. A Charm Pack contains at least one 5″ square of each fabric included in that fabric line. Turnovers contains 80 triangles (40 squares). Join 2 triangles to make a 5″ half square triangle block. 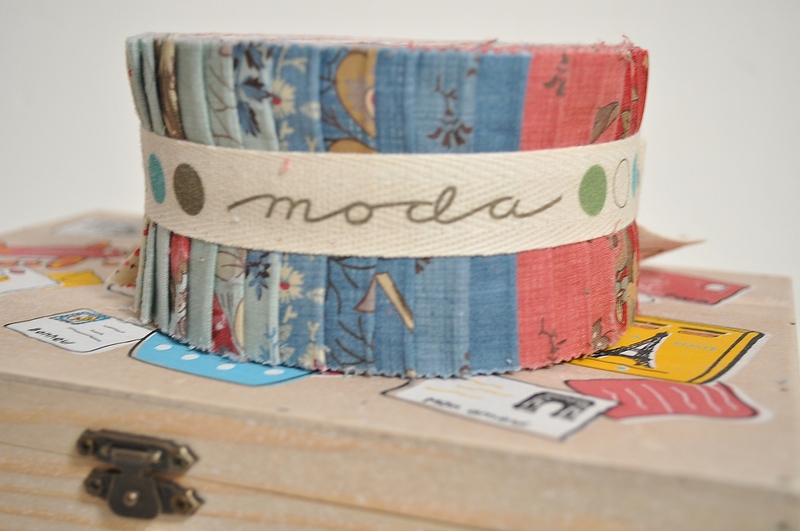 A Jelly Roll contains 40 strips, 2 1/2″ x width of fabric. A Honey Bun contains 40 strips, 1 1/2″ x width of fabric. A Jelly Cake contains one Layer Cake AND one Jelly Roll! What hope is there now for those of us who already have a fabric addiction? 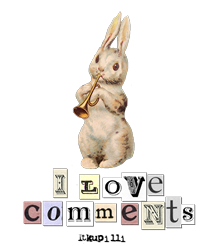 These people really know how to push our buttons. Have they no pity?